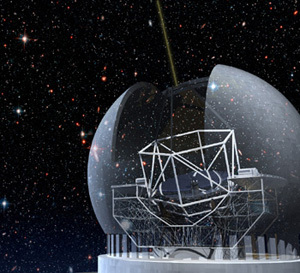 The Thirty-Meter Telescope project is now in the detailed design stage. Credit TMT Project. The University of California and the California Institute of Technology have each received $7.5 million in additional funding from the Gordon and Betty Moore Foundation for the development of the Thirty-Meter Telescope (TMT). The TMT is being developed by a U.S.-Canadian team, with construction anticipated to begin in April 2009. The new grants augment the $64 million already planned for the design development phase of the TMT project, which included $35 million previously awarded to UC and Caltech by the Moore Foundation. "This new award from the Moore Foundation will enable us to reach construction readiness and will also initiate industrial production capabilities for the primary segments of the telescope," said project manager Gary Sanders. The TMT is now at the stage of detailed design. When completed it will be the world's largest telescope. It consists of a primary mirror with 492 individual 1.45-meter segments that span 30 meters in total, three times the effective diameter of the current largest telescopes. All of the segments will be under precision computer control so that they work together as a single mirror. The TMT will not only be the largest optical telescope in the world, but will also be at the forefront of technology in virtually every aspect of its design. Adaptive optics (AO) will allow the TMT to achieve a resolution comparable to a space telescope. Because TMT project engineers are integrating this system with the designs for eight science instruments, the power of the AO system should be available at the beginning of the telescope's operations in 2016. The baseline AO system for the TMT involves six laser beams launched from a small telescope from the top of the structure that supports the telescope's secondary mirror. These laser beams create luminous spots in a layer of sodium atoms high in Earth's upper atmosphere, providing artificial points of light analogous to distant stars. These pointlike laser-illuminated spots drift and wobble just like starlight, giving the AO system reference points to use anywhere in the sky as it compensates for distortions of starlight caused by Earth's fluctuating atmosphere. This technology was pioneered at UC's Lick Observatory and is also used by the Gemini Observatory 8-meter telescopes and the W. M. Keck Observatory 10-meter telescopes. Much of the TMT's scientific work will be done in the infrared, where the best resolution is easier to attain, young stars and galaxies are to be found, and the opportunities for new discoveries are abundant. The TMT project is studying five high sites in Chile, Hawaii, and Mexico as possible locations for the telescope, with site selection planned for May 2008. Three reviews by an independent panel evaluated all aspects of the project, including its optical design, the telescope structure and its enclosure, science instrumentation, site testing, management, and cost estimate procedures. The panel reached positive conclusions about the level of design development and the prospect for construction readiness by April 2009. The TMT is a collaboration of the California Institute of Technology, the University of California, the Association of Universities for Research in Astronomy (AURA), Inc., and the Association of Canadian Universities for Research in Astronomy (ACURA), with significant work being done by industry and by university teams studying instrument designs. The project office is in Pasadena, California. The Gordon and Betty Moore Foundation, established in 2000, seeks to advance environmental conservation and cutting-edge scientific research around the world and improve the quality of life in the San Francisco Bay Area. For more information on the TMT project, visit the project web site.